—what if you could pay with just a tap? 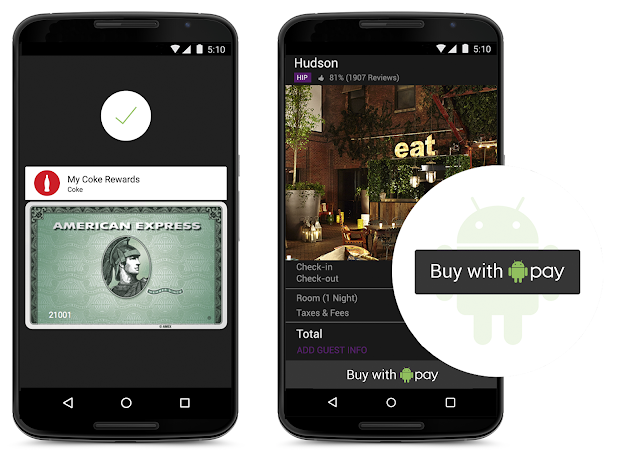 Introducing Android Pay, the simple and secure way to pay with your Android phone. Things are more interesting when we create them together. So we’ve approached Android Pay the same way we approach every other part of the Android family -- partnering with the ecosystem -- bringing together mobile carriers, payment networks, banks and retailers to deliver you choice and flexibility. And offering developers an open platform to collectively push mobile payments forward. With Android Pay, you can simply unlock your phone like you normally do, place it near a merchant’s contactless terminal, and you’re good to go. Android Pay does all the heavy lifting. You don’t even need to open an app—just tap and go. You’ll also see a payment confirmation and get transaction details right on your phone. Also, with select retailers, your loyalty programs and special offers will be automatically applied at checkout. For example, when you tap to buy a Coke at a vending machine, your MyCokeRewards will be automatically applied. With Android Pay the contactless terminal not only receives your payment info, but also your loyalty programs and offers. Making an online purchase? The days of entering your credit card and shipping address each time you make a purchase online will be a thing of the past. Just select “Buy with Android Pay” and leave the rest to us; checkout is as fast as a tap. To make it easier for developers to add Android Pay to your favorite apps, we’ve designed our platform to work with any payment processor. And we’re partnering with top payments processors including Braintree, CyberSource, First Data, Stripe and Vantiv to make integration even easier. With Android Pay you will be able to pay with your credit or debit card, across multiple Android devices, and at thousands of stores and apps that you already know and love. And by enabling bank apps to integrate with our platform, you’ll be able to add your credit and debit cards directly from bank apps for use with Android Pay. It's still early days, but we're very excited and think that this type of open platform will help drive adoption in mobile payments. We know how important it is for you to keep your personal and financial information secure. Therefore, we’re working with leading payment networks and financial institutions in the US to deliver industry standard security tokenization, to support Android Pay’s launch later this year. So when you shop at a store, Android Pay won’t send your actual credit or debit card number with your payment. Instead we’ll use a virtual account number to represent your account information -- providing you with an extra layer of security. And if your phone is ever lost or stolen, simply use Android Device Manager to instantly lock your device from anywhere, secure it with a new password or even wipe it clean of your personal information. Android Pay will soon be accepted at over 700,000 store locations from your favorite brands across the US, and in over 1000 Android apps. And we’ll be adding more every day. Android Pay will be available on Google Play for download soon. And when your bank integrates, you could also activate Android Pay directly from your bank app. We are also working with major US mobile carriers (AT&T, T-Mobile, Verizon) to help ensure that when you buy a new Android phone, you can walk out the door ready to use Android Pay. Look forward to sharing more in the coming months. Credit cards, debit cards, loyalty cards, cash, coins. Forget fumbling through your wallet next time you’re in a store—what if you could pay with just a tap?